Liquid Drywall is a canned spackle spray that will repair holes and cracks in your drywall in just seconds. It's white, but after you spray it and spread it by using the included spreading tool that doubles as a lid, you can paint it any color you choose. Areas treated with Liquid Drywall are safe to sand, too, and the spray comes with a sanding pad. The spray will dry fast after it hits your wall, but it won't dry out easily in its container. Although it's not suitable for use outdoors, you can use it within any room of your home. Using Liquid Drywall will make all the walls within your home look attractive, as you'll quickly be able to cover up cracks, holes, and dents, regardless of whether they're large or small. This formula has the strength and durability of drywall itself, yet it's not complicated to use, as it only requires the use of a small spreading tool and a paintbrush. Unlike spackle paste that comes in a container that won't spray, it is unlikely to make a mess of your hands and / or your work area. Virtually anyone can use this spray without problems, so making use of it will enable you to complete more repairs on your own, without calling in a professional. The cost of Liquid Drywall is $10.00 plus $7.95 shipping. The special TV offer allows a free gift which you will receive by paying an extra fee of $4.95 for a total price of $22.90. This price was obtained from the As Seen on TV commercial page which was taken offline due to Liquid Drywall being discontinued. Liquid Drywall may still be found for sale on Amazon or Ebay. Liquid Drywall's compound formula has been designed to be as strong and durable as drywall, so it's as if the developers have simply turned actual drywall into liquid and put it in a can. After it's spread around with the appropriate tool, it'll dry quickly and become just like any other part of the wall it's been applied to. Following that, paint can be applied to the repaired area, or the area can be sanded, without issue. Spray some Liquid Drywall on the crack or hole that you want to repair. If the crack or hole is large, you may need to use a few sprays. Use the included spreading tool, which will also act as a lid for your bottle, to spread the Liquid Drywall across the entire hole or crack. Wait a few seconds until the substance dries. Liquid Drywall is white, so if the wall that you've spread it on is any other color, you'll need to paint the area that's been sprayed so it matches the rest. You can do this with a standard paintbrush. If you or a former resident of your home has used nails or thumbtacks to attach pictures, posters, or other fixtures to the walls, ugly holes may be visible. Fortunately, you can use Liquid Drywall to fix any of these, and then your wall will look as good as new again. When walls get old, they sometimes begin to develop hairline cracks, so if you have an old house, Liquid Drywall will come in handy. Once you spread it over any crack, you won't be able to see the crack any longer; plus, you'll be making your home sturdier. In any home, walls can easily be dented by doors, furniture, or children's toys. Regardless of whether these things have created big or small dents in your walls, you can rest assured that Liquid Drywall will be able to fill these dents in. Spackle paste is often used to repair dents, holes, and cracks in drywall, but it doesn't come in a spray bottle like Liquid Drywall, and it will often dry out in its container. Liquid Drywall, on the other hand, will not dry out in its bottle. Furthermore, it is much less messy to use than spackle paste. Since each bottle of Liquid Drywall comes with a spreading tool, you won't need to get a metal spreader in order to use the spray. Each Liquid Drywall bottle also comes with two small touch-up paint tubes, which store paint for you to use if you need to touch up your walls after treating them with the spray. Since it's safe for you to sand areas that have been treated with Liquid Drywall, a sanding pad is included with each bottle, too. Liquid Drywall is only suitable for use indoors, so you can't properly use it on the outer walls of your house, or on your deck. The compound formula gives Liquid Drywall the ability to fix holes and dings in the walls with such strength you won't need to hire a repairman. While we can't find the ingredients on the official site, the formula for quick drying spackle often includes gypsum, water, limestone, perlite, ethylene-vinyl acetate polymer, and attapulgite. You can keep your hands and floors clean. You control the bottle, so you can spray as much or as little as you like. No need to worry about a glob of spackle dropping on your floor or on your hands. The formula is made so you can quickly and easily repair your walls and repaint. No need to waste time letting spackle set for hours. 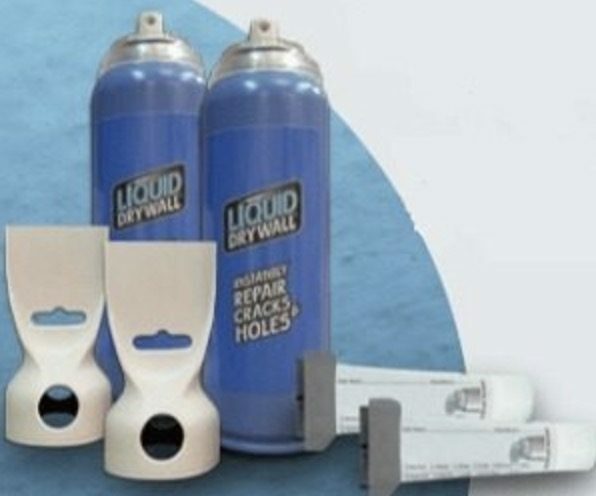 The one bottle of Liquid Drywall is able to fill in up to 100 holes in your walls. It's always beneficial to have a window open when using any type of spray to repair your home. Liquid Drywall is often used in small amounts, but still, have some ventilation in the room. Before applying Liquid Drywall, make sure your wall is clean. If there is cracked drywall, remove the fragments and even the surface. You might need a small piece of sandpaper to smooth the spot. Do not use on a wet surface. Let the surface dry before smoothing or applying any spackle. Liquid Drywall is perfect for small projects like dents from doorknobs, furniture dings, or nail holes. However, if someone punched your wall and left a great big hole, you will have to call a repairman or buy a bucket of spackle. The only place you can purchase Liquid Drywall is from the official website. Other retailers do not sell this product and there are not many customer reviews. Perhaps it can be found in stores, but the names and locations are not listed. There are very few customer reviews online, so it's hard to say how successful people have been with this product. The official list of ingredients is not available, so it is not clear how their formula is different from their competitors. The spreading tool that attaches to the bottle is helpful and is not always included with similar products. The price is within the range of its competitors. When purchased on the official site, you get two bottles and two spreaders. Your first set includes free shipping. The site also promises to double your offer for a fee. This product is an amazing quick fix. It is advertised to only take minutes to dry rather than hours. The easy application makes it simple so that anyone can tackle this DIY project without training or hard to understand instructions. No need to wait hours or days to have an appointment with a handyman. You won't need to wait for the project to dry either. When using the spray bottle, start with a smaller amount than you need. The bottle has a high-speed sprayer, so more may come out than you think. You can always use the spreader to remove excess, but why waste the product? Liquid Drywall is mess free and can be used without protective gear. However, if you have allergies, wear gloves and a long sleeve shirt until you're sure there is no reaction. It is a spray and if it is sprayed in the wrong direction, it might get on your hands or arms. After it's applied, make sure you smooth the surface evenly using the attached spreader. You do not want any bumps or bulges on your wall. Do not buy Liquid Drywall online before searching Amazon. How Can I Buy Liquid Drywall ? How can I buy Liquid Drywall? Was an advertisement like that cool is really going to buy this product it looks like it might be a good product but I think you need to get rid of the spokesperson I'm really disappointed somebody that would hire man that would use language like he has I am not impressed by this and I haven't talked to several other people who feel the same way so if you really want to say you might want to check the person first. 6 of 13 people found this review helpful. You probably saw the parody version. You can easily look up the real one no problem. You can’t be that dumb. You probably saw the "Jaboody Dubs" Parody for this product. How can I order this Liquid Drywall? Thanks for the great review! Super helpful! Did you find it? I really want to know. You can buy it at walmart and target.